An exhibition helps us better understand the ‘art of the book,’ one of the most prized genres in Islamic societies. * * * Imagine a 948-page book so large that, open, it stretches 3 feet across. Imagine further that as you read of heroism and intrigue, romance and war, bloody battles and festive celebrations, every so often you turn the page to find not columns of words but a painting in colors as rich as its composition is dense. “Princeton’s Great Persian Book of Kings” can’t offer visitors to the Princeton University Art Museum that tactile experience, but the show helps us better understand the “art of the book,” historically one of the most prized genres in Islamic societies. 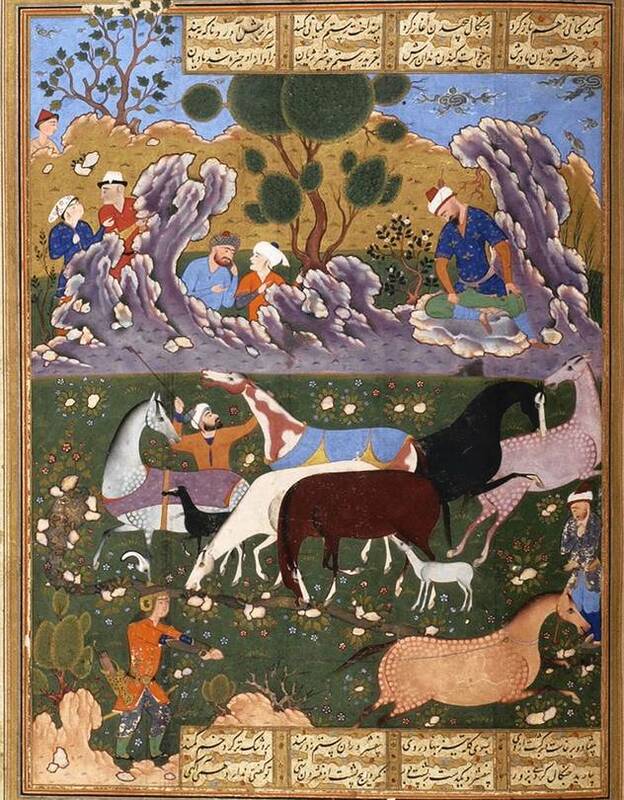 The exhibition does this by displaying all 48 paintings of a 1589-90 Shahnama (often spelled Shahnameh) made in Shiraz, a center for the production of luxury books in south central Iran. (A 1983 bequest by book collector Clara S. Peck, the manuscript has been carefully—and temporarily—disassembled by conservators to preserve its pages.) The paintings work in concert, sharing conventions of composition and a palette of golds, blues, lavenders, greens and oranges. With some 50,000 couplets of mythical, legendary and historical exploits from which to choose, the illustrations include dancers and musicians entertaining courtiers, men on horseback playing polo, and celebrations unfolding in beautiful indoor-outdoor settings. Warriors take prisoners, slay enemies, mourn their dead. Horsemen charge, arrows fly, swords bisect heads, and in some hunting scenes, man is but one among many animals pursuing prey. The illustrations appear at irregular intervals, suggesting that the workshop master was not following a template but, rather, making sure particular scenes were depicted. Guest curator Marianna Shreve Simpson speculates that the book was, in fact, a royal wedding gift with political overtones. This would certainly explain the groom approaching his betrothed in the final Shahnama scene depicted and the inclusion of a minor incident in which the people of the bride’s home province bow to the king. Throughout, Ms. Simpson reminds us of the paintings’ original context with occasional bound copies of Shahnamas and illuminated pages of text penned by calligrapher Qivam ibn Muhammad Shirazi, the only contributor whose name we know. Still, the illustrations dominate. In one remarkable scene, a giant dragon swoops down from the mountain to devour a cow offered by fearful locals; in another, the sea surrounding a king’s ship swarms with earthly and otherworldly creatures. And no matter what occupies center stage, check the periphery—there may be monsters and angels, long-tailed simurgs and grotesque demons, some even incarnating as rocks. For lovers of painting, this presentation is akin to skipping the greens in favor of the dessert cart. Ms. Lawrence writes about Asian and Islamic art for the Journal.